Nothing could be more devastating than watching one’s own healthy, beautiful born child transformed to a horrible sight, no thanks to a sudden ailment. This was the predicament of 12-year-old Wisdom Geofoeyin, who developed tumour in his left facial region, diagnosed as ossifying fibroma – cancer of the immune system. Wisdom was living with this strange ailment that caused him a lot of discomfort for three years now, while her low income earners parents watched him helplessly. 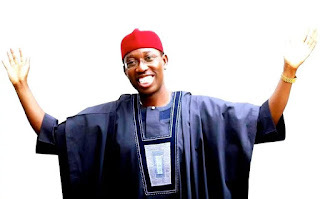 However, help came to him recently, from Senator (Dr.).Ifeanyi Okowa, Delta State Governor, who sponsored his surgery at the Delta State University Teaching Hospital (DELSUTH), Oghara. Describing his suffering before the surgery, Wisdom told INDEPENDENT; “I travelled to Port Harcourt with my father and we stopped over in a hotel. The hotel attendant walked close and asked me to walk out of the hotel because of my facial appearance that looked grotesque. His father, Omadina Geofoeyin, a retired teacher who is native of Omadino in Warri North Local Government Area of Delta State, but resides in Niger state, while narrating his ordeal, stated, “The growth started small in 2014, but it came to his attention as something getting bigger in 2015. “The excruciating pains, difficulty in breathing and the sleepless nights which Wisdom passed through, due to the growth that gradually occupied more than half of his face, become a great concern for us. “We were more scared of losing him, and as a result of which, we had to apply traditional medicine, visited different hospitals both in Sokoto as well as Minna, Niger state, where series of test was conducted, Geofoeyin explained. “However, we did not have money to foot the operation expenses. I explored every avenue to seek help from well-meaning Nigerians in Niger state, but no assistance came forth, until providence brought me to Oghara, having heard that Senator (Dr.) Ifeanyi Okowa was to hold a town hall meeting. “The sight of the Governor on the dejected and helpless state of my son moved him with compassion and he quickly recommended that the child should be taken to the Oral and Maxillofacial Clinic of the DELSUTH at his expense, as he believed that DELSUTH had the facilities and capable hands to remove the tumour,” the retired teacher added. The Chief Medical Director of the Hospital, Dr. Onome Ogueh, was delighted over the successful surgery. He thanked the Governor for having real interest in the health sector and for all he has done for DELSUTH since he came into office. Dr Mabel Etetafia, a Consultant, Oral Maxillofacial Surgeon told journalists after the surgery that she was happy about its outcome.